Cambridge, MA, and Dublin, Ireland— Today, HubSpot, the inbound marketing software company, announced a $30,000 incentive program to reward individuals who refer developers and designers to the HubSpot team. HubSpot, which grew 82% in 2012, is rapidly expanding their team and expects to add significant development, design, and engineering resources within the next six months. The $30,000 fee will be paid to the referring individual after a candidate is hired by HubSpot, and applies only to software engineers and designers working on the product team. In addition to the bonus for their referring friend, all HubSpot employees receive tuition reimbursement, unlimited vacation (based on the company’s overarching policy to “use good judgment”), and the chance to be part of a rapidly growing company that is transforming marketing worldwide. People interested in referring friends or colleagues can do so by submitting their information here. 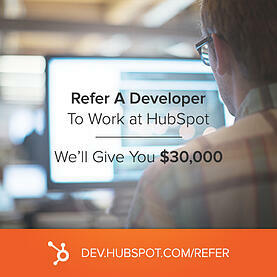 Referral bonuses are not relegated to HubSpot employees; anyone can participate. Individuals cannot refer themselves, and the $30,000 bonus applies only to full time hires on the HubSpot product development and engineering team. To read more about HubSpot’s development team culture, click here.